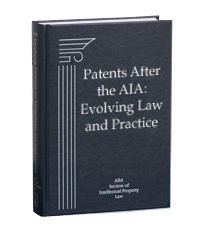 The AIA has fundamentally altered patent law by transitioning from a “First-to-Invent” to a “First-Inventor-to-File” patent system. Patents After the AIA: Evolving Law and Practice will provide you with insights and advice for patent application preparation and filing, post-issuance review, and challenges to patentability and ongoing international patent law harmonization. Each chapter includes descriptive titles and headings — allowing readers to quickly access specific topics or issues of immediate need or interest. Extensive cross-references are also provided to related sections providing additional, in-depth, comprehensive discussions. More than 200 “Practice Tips” to highlight key points and serve as warnings and guideposts to the patent professional. More than 100 original graphical timeline scenarios provide a myriad of different fact patterns analyzed under the AIA and compared to pre-AIA outcomes. In-depth analysis and policy discussions explain complex changes to the law. A glossary of more than 400 terms and phrases with concise definitions and descriptions, intended to enhance the precision and consistency of patent law discussions regarding the intent, implementation, and impact of the AIA, addresses the existing lack of clear terms and phrases that capture the fundamental changes to U.S. patent law encompassed by the AIA. Thousands of footnotes provide support for the treatise and serve as easy references for the reader to find the source materials that are discussed. Alan J. Kasper,a senior partner in the international intellectual property (IP) law firm Sughrue Mion, PLLC. Brad D. Pedersen, a partner and the chair of the patent practice group at Patterson Thuente Pedersen, P.A. Ann M. Mueting,PhD, JD, a founding shareholder of the firm Mueting, Raasch & Gebhardt. Gregory D. Allen,Assistant Chief Intellectual Property Attorney at 3M Innovative Properties Company, a subsidiary of 3M Company. Brian R. Stanton, PhD,a principal at Stanton Consulting Services where he focuses on IP, trade, and associated technology innovation policy matters.